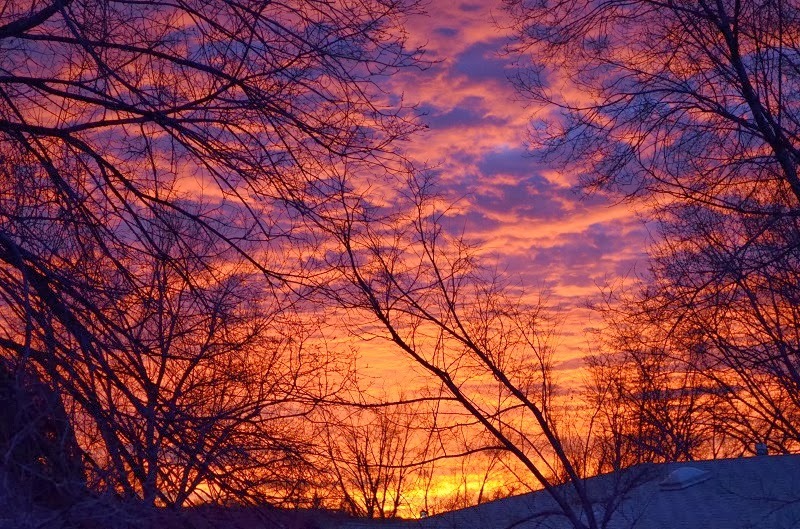 I must say, we've had more than our fair share of breathtaking sunrises this winter! I experienced my first sunrise just a few years ago when my son started school. As a night owl by nature, I rarely, if ever, saw the sunrise. Sure, I must have seen it. Perhaps in my college days, stumbling home from a night-long party. Or maybe on a long, red-eye flight to London, trying to snuggle into a stiff airline seat to catch a few moments of sleep. But had I ever actually experienced a sunrise in all its splendor? 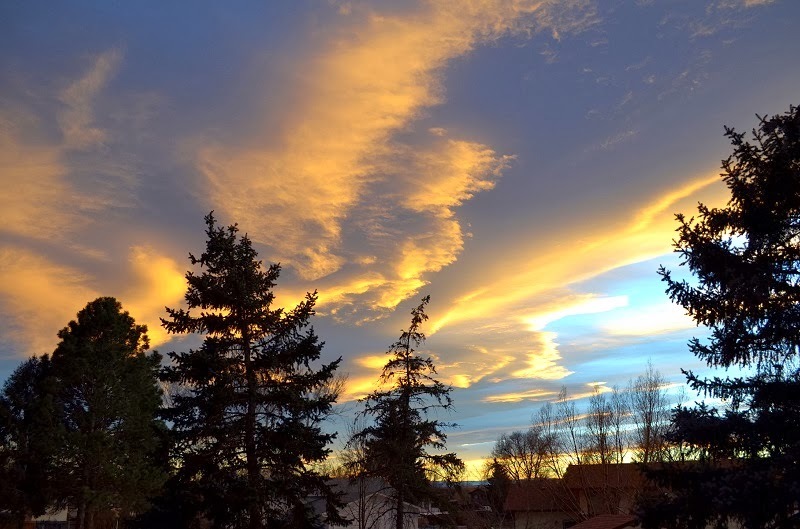 On that day, when Connor started kindergarten, I rose early, before the sun and, by chance, found myself standing at the kitchen door as the sun was just beginning to rise. It was still and very dark; the moon was a fine crescent hanging low over the mountains in the west. Across the sky I watched as ribbons of violet, magenta, orange and amber slowly pushed away the darkness. It was then that I realized, in sudden horror, what I had been missing. Funny, but I always imagined that the sunrise would look much like the sunset - pastel hues of pink and orange that slowly fade to grey - but this was entirely different. Untamed, raw and powerful. In that moment I thought, What have I missed all these years?! Perhaps dawn is the one time when mere humans can catch a small glimpse of the sheer radiance of God. These days I have a favourite morning ritual. I rise before the break of dawn, wrap my warm robe around my shoulders and slide into my slippers. In the kitchen I put the kettle on for coffee, being very quiet so as not to wake the kids. This is my time, not to be interrupted. I pour coffee into my favourite mug with just a splash of cream and stand in the kitchen doorway. The steam rises from the mug in my hands as I let the warm, gemstone colors of dawn wash over me until, at last, the sun breaks the horizon with such brilliance I have to turn away. Then I can start my day. For some reason all this makes me think of Breakfast at Tiffany's. As Holly Golightly strolls past the windows of Tiffany's at day break. Doesn't she say something like, nothing very bad could happen to you at Tiffany's. If I could find a real life place that'd make me feel like Tiffany's then - then I 'd buy some furniture and give the cat a name! I think I found my real-life Tiffany's, right here in my kitchen. With the first rays of sunlight illuminating the walls like a jewel box, I find myself thinking nothing very bad can happen here. On the weekends I tend to sleep in and miss my sacred time with the sun. That's where these muffins come in. They remind me of the sunrise, and I often make them on lazy weekend mornings. Sunny and bright, and easy as Sunday morning, they're inspired by my mother's favourite cake, a poppy seed pound cake with lemon glaze. I serve them with the very best European style salted butter, whisked with honey until light and fluffy. Preheat your oven to 400 F (200 C). Line a 12 cup muffin pan with paper liners and spray with nonstick spray. In a large bowl, cream the butter and sugar until light and fluffy. Whisk together the flour, baking powder, poppy seeds, and salt. Mix together the milk, eggs and vanilla. Beat half of the flour mixture into the butter, followed by half of the milk mixture. Add the remaining flour and the remaining milk, beating well after each addition. Spoon the batter into the muffin pan and bake 15 - 17 minutes. 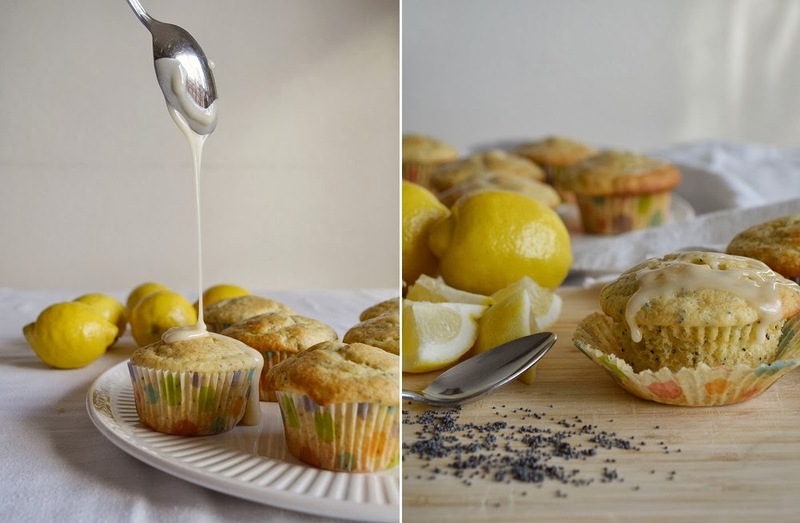 While the muffins bake, prepare the glaze by mixing the lemon juice, honey, water and icing sugar until smooth. When the muffins are done poke a few holes in the tops with a toothpick. Spread the glaze evenly over the muffins and allow to cool. I serve these with whipped honey butter. Use the highest quality butter you can find. 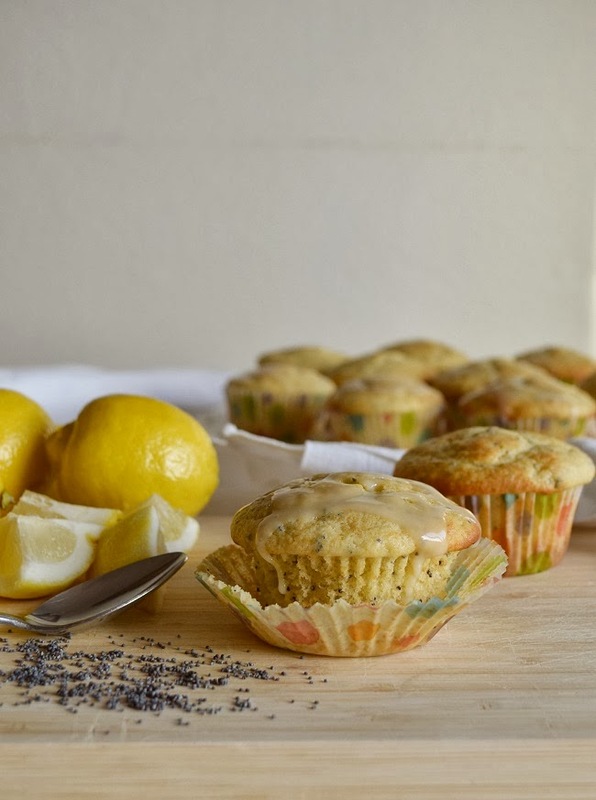 Looking for more muffin recipes? Try these.